Judges overall comment: The panel enjoyed the many innovative projects undertaken by the range of organisations represented. The panel noted in particular the huge development of the field, encompassing high quality and diverse activities. Artology for Fanfare Competition (Winner) – This outstanding program offers everything to its young participants: mentoring, composition, recording, broadcast and audience, in a systematic and thoughtful process. One piece of music has been heard at the Sydney Opera House more than any other. It is played sometimes dozens of times a day and more than 1000 times a year. The entire composition consists of two alternating notes, A and F sharp, in a plodding loop on a fake xylophone. … The Monthly magazine by Darryn King, October 2014. We need to act on young people’s demands for active – not passive – engagement, says the Chief Executive of Sydney Opera House. Read the in by Louise Herron is the Chief Executive of the Sydney Opera House. A musical piece by Wincholsea teen, Hannah Hunt, is playing at prestigious venues across the country. Read the article from the Colac Herald, 03.18. Student Caitlin Buchan has won a spot to have her music composition performed nationally at concert halls. Read the article from the Bendigo Weekly, 06.17. Winchelsea teenager Hannah Hunt has been playing music for only about three years and composed just one piece of music, but it is sending her to new heights. Read the article from the Geelong Advertiser, 06.17. Caitlin Buchan has been recognised for her talent as a composer. The 15-year-old Bendigo South East College student was one of eight teen composers selected as a winner in the 2017-18 Fanfare Competitions. Read the article from the Bendigo Advertiser, 07.17. 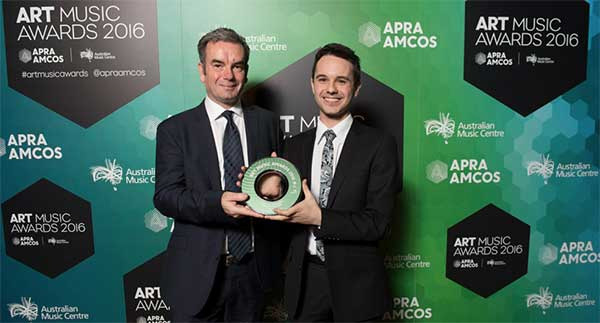 Wolfgang Amadeus Mozart was known for writing music from an early age, and the Bega Valley now has its own young composer who is becoming recognised for his talents. “I found I had a knack for music when I was five,” 13-year-old Oscar Gill said. Read the article from the Bega District News, 30.08.16. How many times have you heard the cue bells chiming at the Sydney Opera House as you hastily finish your champagne. Fanfare is highlighted in the 2MBS Fine Music Magazine in June 2016. …Read the article on pg.6. Sam Weller one of our 2016 Fanfare participants and mentor composer Nicholas Vines were guest on ABC Classic FM Mornings with Martin Buzacott. Hear the interview [approx 28:25 mins into the program]. The 2015 competition’s next round of eight are currently undergoing a series of workshops with renowned Australian composer Nicholas Vines, the Australian Youth Orchestra and leading conductor Daniel Carter to refine their compositions. Read the article in APRAP. Our mentor composer Nicholas Vines and Yilan Yu one of last year’s Fanfare winners were interviewed on ABC Classic FM on Tuesday, 5 May 2015. Hear their interview on ABC Classic FM with Christopher Lawrence, starts at approx. 26mins. Teenage musicians compose new fanfares for Sydney Opera House. “The fanfares will be used throughout the 1700 performances in 2015 so these young people will be our most performed performers at the Opera House this year,” Ms Herron said. … Sydney Morning Herald, Rose Powell, March 2015. At the Sydney Opera House the creativity of eight youthful Australian composer hopefuls is currently being expressed in Fanfares now alerting patrons that shows are about to begin. … The Culture Concept Circle, Carolyn McDowall, March 2015. Ding-dong, the bells of inspiration are ringing at Opera House. Sydney Opera House calls for young composers to write new audience cue. Sandra Eglezos, Principal, Belmont High School: Thank you for allowing us to be involved in the launch yesterday. It was a great day for Hannah and her family and certainly we were proud of Hannah and her achievements. Belmont High School will be promoting your program and encouraging other students to get involved. This program is amazing and you should be rightly proud of the achievements gained by all participants. The students have had an opportunity that others would only dream of. The rewards for the students are obvious but I think that the program will benefit as these young people might become mentors to others in the program as the years go by. Thanks for inviting us to the Fanfare event today. It’s the type of initiative that I love. Knowing nothing about music I find it astonishing that those pieces were created by such young composers. It’s a really clever way of showcasing the extraordinary talent of young people in an environment we associate with artistic excellence. Just brilliant. What an opportunity to develop the art and love of music! Definitely a great initiative and opportunity – demonstrates support from a major Arts Institution. Amazed by the quality and style for the age. It’s an incredible opportunity and opening for the youths. Any opportunity for using creativity to support learning is to be valued. The competition I believe will inspire many music teachers to encourage the development of music in Australia. The works are of very high standard and will be a refreshing change from the usual beeping. Congratulations on this innovative initiative! With your superb publicity, news of this should spreads far and wide, and that perhaps all cue bells throughout the land, will soon be replaced with similarly inspirational sounds! We’d love your feedback on the Fanfare Competition, please email or call on 02 8007 7322.